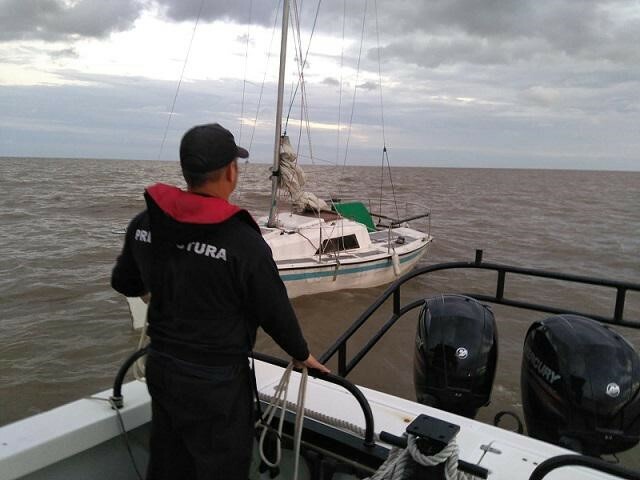 The National Navy of Uruguay through its Prefecture of the Port of Colonia managed to rescue three Argentine sailors when their sailboat began to make water while crossing the Martín García channel, 6 nautical miles from the coast. On Sunday afternoon, personnel from the Port of Colonia Prefecture received a radio call from one of the crews of the sailing ship Aquelarre, of Argentine flag, informing that they had a water intake at the height of km 62.9 of the Canal Martín García. The Coordination Center of Search and Rescue at Sea alerted the situation to the ships that were travelling near the position of the sailboat, to try to assist it; Simultaneously, from the Prefecture of the Port of Colonia (PRECO), we set sail on board a patrol boat to assist sailors. Once in place, the PRECO personnel evacuated the crew members who were aboard the boat that was already semi-sunken and were transferred to the Port of Colonia, where a mobile emergency unit was waiting for them. Subsequently, the Honorary Association of Maritime and River Rescue provided support with the boat ADES 69, to prevent the boat from sinking completely, using bilge pumps and thus preventing it from blocking the transit through the channel.